With the damage of Monday almost completely repaired, Tempest again sped on in its race with Whisper. These are the North Atlantic conditions you see in pictures. Solid grey clouds, heavy wind, seas rolling up behind us to give us boiling rides down their front. Rain squalls. But, fortunately, not cold temperatures. We are still south of the Gulf Stream, and the water temperature is in the fifties, not the thirties or forties. The wind builds and gets strongest by night. Tomas is sleeping in; he has been repairing the big spinnaker with Ashley all day. We go on deck at midnight UCT, about 10 PM if we were on local time. Question before going on deck: what to wear? Too many warm layers and you sweat a bucket while steering. Too little and you are cold. I pick fleece salopettes (like overalls) under my outer clothes, but no fleece jacket. Our four-hour watch is at the darkest time. Too late for twilight, too early for dawn, and no moon, if it could get through the clouds, until the last hour. There is too much wind to put up the repaired spinnaker. It is steadily over 30 knots. 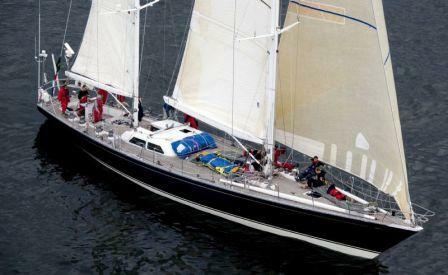 We are using the blast reacher -- a sail we put aboard for this race, -- and a staysail. Steering is difficult, but not unusually so. The wind and waves are coming from our starboard quarter -- think about 4:30 on the clock face. At about eight feet high, they are small enough not to be threatening, but big enough to twist the boat's path into a corkscrew. So the helmsman must constantly steer against the corkscrew and respond to puffs and lulls in the wind. Max Hutter takes the first turn at the wheel, and drives for a little under an hour, He is watching the lighted digital display of speed, course, and apparent wind angle. Someone else calls out changes in wind speed from another display. He is good at holding the course with minimal motion of the helm. Big changes in the angle of the rudder mean that you are dragging a barn door sideways through the water; it is slow. The wind is generally 30 to 35 knots, heavy air but just right to give us speed. We often hit 13 knots, and occasionally 14. I take over the wheel for a half hour. I need a light on the compass card; my reactions are not tuned to the changing numbers on the lighted digital display. We are running in and out of rain squalls. Pouring now, nothing ten minutes later. As the time goes on, the sweat builds up inside my foul weather jacket; glad I didn't wear the fleece jacket, too. Wind speed is inching up just a bit. Phil Wilmer takes over next. The wind builds a bit further to top speeds of 37 and 38 knots -- about 44 miles per hour. We adjust and readjust the sails, but basically they are right for the wind. Phil has a knack for getting us surfing down the face of the waves. Several times he goes past the 14's and into the 15's. We chant. ''Fifteen three! Fifteen four! Fifteen five! Fifteen six! Fifteen six! Fifteen five!'' Gradually the exceptional becomes the expected. We are flying. Christian Jansen's time at the wheel is similar, but the wind is easing just a bit. At one point I find myself saying, ''The wind is slack. Only twenty-nine.'' Then we all start laughing. We now think that twenty-nine knots of wind is slow going. We keep rotating turns at the wheel. I skip my next turn -- too much wind for comfort. So I cool down and get chilly. Sorry I didn't wear my fleece jacket. Finally Peter Becker and his 0400 watch appear. It is over; we can sleep. Â But in the morning, we learn that all our work gained us nothing on Whisper. We gained again on other boats, but Whisper has been flying, too. She has added ten miles, about the same as her handicap predicts. 1100 miles to go. Back to work. Then another disappointment. The wind goes lighter, The spinnaker Ashley, Tomas and Kevin spent yesterday repairing comes up on deck. Carefully it is hauled up to the top of the mast, tied with its knitting wool strings. The sheet is pulled, the wool ties beak like a zipper opening, the sail spreads -- and rips to pieces again. We take it down and find that, inexplicably, the stronger-than-steel Kevlar reinforcing line along the edges has snapped. Our fastest sail for these conditions is gone again. When we get the sail out of the water and below decks, Ashley and Kevin have already laid out the repair materials on the saloon table, like an operating room. Next patient, please. Tempest had a superb day going until just after midnight UCT, or about 8 PM on the East Coast. We gained distance on every boat in our class, including bigger ones that owe us time. With our big chute flying in up to 26 knots of wind, Tempest roared ahead at twelve and thirteen knots.Around our midnight, as the watches were changing, we started seeing 28 and 30 knots of wind -- time to drop the big chute. We held on and talked about the takedown, then troubles hit twice. The wind pushed the boat into a broach, with the boat heeling over more and rounding up. The boom was pushed into the water, and the preventer -- a line that holds the boom against an uncontrolled jibe -- broke its restraining block. The strain caused a hairline crack in the boom around the vang attachment point. It means damage and strain that we will have to deal with carefully.A few moments later, with a big pop, the wind blew off the top of the spinnaker about ten feet from the top. The bulk of the sail fell into the sea, and had to be dragged out of the water and shoved down the hatch. The top of the spinnaker, still attached to its halyard, wrapped itself around the headstay and remained aloft. The boat was brought under control and a new sail set, the blast reacher. Tomas went up the mast and retrieved the top of the spinnaker, virtually undamaged by its time in the wind. Tempest returned to very nearly its earlier speed. She lost perhaps a half hour of time, or roughly five miles. Nobody was injured. Some of the crew have aches and strains from earlier, but everyone is very careful about safety, and good luck lent its helping hand. Before the midnight messiness, Monday had been a day of learning all around the boat -- Peter Becker taught better steering, Ashley and Tomas taught sewing and sail repair. Will Hubbard, who already knew much, is now an expert splicer. We were smoking. Steering at these high speeds is tiring. The best and the strongest helmsmen are doing most of it, and they need to rotate often. Despite the surprises and tough work, everyone is pushing his and her hardest. Ashley is now one handed so requires help in the sewing department so has opened up the â€œchicken wingâ€ sewing â€œclubâ€ in the salon. Tomas is also a sailmaker so the two of them work through the night on the repair. The repair is not a small one taking 12 hours to repair as the tear went fully across the spinnaker from leech to luff then down the tapes and one of the clews was torn away. The trusty sewing machine is worth its weight. Â As this is being written early Tuesday morning, the spinnaker is already mostly repaired. It will be aloft by afternoon. Another great sailing day -- nearly flat water, clear skies, hot weather, strong following wind, our biggest spinnaker up for all 24 hours, and even a small wind shift to help us down the course. It really doesn't get any better.Our Sunday isn't quite over. We are running the boat's clock on UCT â€“ the old Greenwich Mean Time -- so Sunday ends for us four hours earlier than on the East Coast. But it looks like another 250-plus miles for 24 hours. We are near the midpoint of the course in seven-plus days, which we consider excellent. Right now we are out of touch with other fleet positions. That information comes through a Globalstar satellite, and between the continents there is a gap, which we are now crossing. So we do not know how we stand in the fleet rankings, but we know that 250-mile days cannot be all bad. And hot weather to boot. Most everyone was barefoot and in shorts today, which seems incredible. We are still south of the Gulf Stream in very warm water, and on the same latitude as New York, Madrid and Rome. The boat continues to dry out and make living happy. The crew did major maintenance today. Ashley again went up the rig to re lead the spinnaker halyard that was originally lost however, on her way up the rig she ripped her thumbnail half off. The incident occurred when the crew member hoisting her up the rig stopped the winch to readjust. As the rig was pitching around Ashley put her hands around the sides of the rig while waiting. At the same time the main flopped forward and back. By coincidence when it flopped back against the rig Ashleyâ€™s thumb was caught between the full length batten pocket and the mast. When the crew member pulling Ashley up the rig started to hoist he did not understand Ashley's call to HOLD, her thumb was still caught between the fully powered up main and the mast. Ashley ended up hanging upside down trying to stop herself from being pulled against her thumb. By the time Ashley was dropped back down the rig her nail was hanging on but there was a lot of blood. Â In steps our ER Dr. Kevin McMeel with needles which Ashley hates and he puts it all right. Ashley however, has been told to stay put in the salon with her arm in the air until the swelling has subsided. Â Tomas Mark, who knew the hours-long procedure from his days as Tempestâ€™s first mate, went up and finished fishing the missing spinnaker halyard inside the mast. He got a round of cheers and applause when he came back to the deck.Will Hubbard learned new skills. With the industrial sewing machine he repaired the torn number three jib and patched the number one. Ashley passed along the skill of how to splice on a new halyard shackle, a job we need to do regularly as the steady spinnaker running chafes the existing end of the line. We switched guys on the spinnaker, again to replace chafed line. Ruud Blanc resealed the joint where the mast passes through the deck, thus heading off water leakage near electrical connections. Racing puts big strains on a boat, and this maintenance is unglamorous but vital. Friends and families can be assured that we are well fed. For lunch, hot chicken breast sandwiches on pita bread. For dinner, beef Stroganoff. Ashley Perrin, half US and half UK. She is our Wonder Woman. 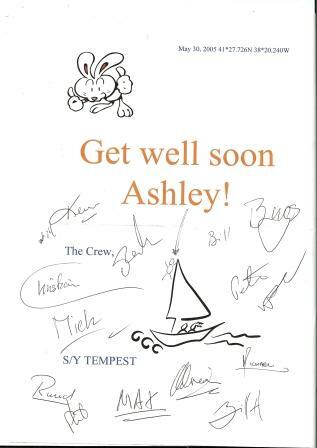 Ashley is the youngest person ever elected to the Royal Ocean Racing Club (at age 15) and she got her UK yachtmaster's theory license at age 16. She can go up and down the mast all day and do anything with the rigging and sails. Phillip Wilmer, from western Canada, has done unnumbered ocean races. He can straighten out anything in total darkness and roaring seas, and is a great shipmate above and below decks. Kevin McMeel, another Canadian (and friend of Phil) has unique and vital skills. As an emergency room MD, he fixes our bumps and burns and gives us great reassurance. As a ham radio operator and as our assistant navigator, he downloads satellite weather pictures in real time. Christian Jensen, our Danish resident of Connecticut, has completed the round-the-world Whitbread race, one of the big, tough races of the world. Christian can do absolutely anything upside down and under water, can fix everything, and this afternoon for amusement cooked up a batch of home-made marmalade. And finally, the indispensable man, our navigator from London, Michael Lawson. Michael keeps our computers and information network running. Eating, sleeping and working by the nav station day and night, Michael has kept us moving in the fastest winds at the best sailing angle. May his magic persist. Around 1 am this morning Ashley went back up the rig to retrieve the spinnaker halyard as the wind was switching to make it favorable for the spinnaker. Yesterday the chain had come clattering to deck so we know the spinnaker halyard that she had had to leave up there was now free to run. Â Ashley went up on the jib halyard that remained - it was dark and we were heeled over carrying the full main and jib it large waves. She had the VHF radio tied on so as to communicate with the deck and a head torch on. Unfortunately as there were no other halyards free she could not attach herself to an external halyard to help hold her to the rig. Â The boat was bucking over each wave and moving violently fore and aft as well as side to side. The motion was pretty bad and excentuated 100 foot up the mast. About 15 feet from the top of the rig on a large wave she was thrown off the rig and was flung around the backstay, main around the leeward side back around the forestay and hit the rig on the weather side. She was now fully wrapped around the rig and there was no way of hoisting her up or easing her down the rig. All the people on deck could see was the reflective stripes on her foul weather gear. Â She held on to the mast tightly trying to radio to deck to tell us that all is fine and that although bruised she is not injured. However, her head torch had fallen into the ocean and she had no way of telling that her radio had changed channel. She tried to lean out from the rig to the thin rod rigging backstay to start to untangle herself. She gets around that and falls back onto the rig. Then she tries to climb out along the mainsail and when she gets to the leech to climb around to leeward the boat goes over a wave and the main flicks her like a small insect around the mast yet again. She again hits the rig with no control over how she lands. She is now wrapped twice around the rig. It is dark and the conditions are still bad. Â She then takes a sail tie which is in an inside pocket and uses this to tie to the backstay, then around the main to the leeward side then to the forestay and the weather rigging etc. Each time she moves to the next goal she ties the sail tie to the part of the rig she is moving around. This will stop her from being thrown away from and around the rigging again. At this point she was shaking and apparently telling herself what an idiot she was. Â After 30 minutes up the rig she finally returns to deck battered and bruised but with the spinnaker halyard. As morning came we left behind the clouds, squalls, rain, lumpy seas and grungy living. Day Seven was just about perfect. Through the day, the wind moved from southeast to southwest, freeing us to set our biggest spinnaker for the first time, 405 square meters -- over 4000 square feet -- of pulling power. With wind speed steady around 24-26 knots, we clicked off hour after hour of running at 11-plus knots. Our top speed when we caught a slide down a wave front was 13.8 knots. The boat is flat again, the first time in days and days. So we cleaned everything, meaning everything. Everyone took a shower. Ashley, a purist, almost lamented the decadence of a hot shower while racing -- "only my second racing shower ever" -- but took one anyway and came on deck smiling. We washed clothes and festooned the rails with drying socks, shirts, foul weather suits, and long johns looking like a refugee ship. All decks below were cleaned, all mess tidied, all loose gear reorganized and stowed. It was like a second start. We switched from three-hour watches back to four-hour watches allowing longer periods of sleep. The food couldn't improve -- it is already terrific -- but it was eaten with more style. We sat around the saloon table, now flat and clean again, and put knife and fork to huge beef pies. And after dinner, the standby watch picked "The Shipping News" (with Swedish subtitles for Thomas Mark's benefit) as the evening's DVD. We all now know how to say certain obscenities in Swedish. A surprise today was a long radio conversation with a 30-foot sailboat racing across our course from Bermuda to the Azores. She must have seen our masts, because she hailed us on the radio. The British voice was cheery, enthusiastic and surprised to find us. For three days Tempest's computer had been on the semi-fritz, and it has been increasingly hard to send and receive emails or to get our position reports. Michael Lawson, ever ingenious, fixed the computer and it is working perfectly again. Allowing us to receive news about the demolition to the boats up north with three boats out and Mari-Cha wounded. As promised, we have finally turned north to the great circle route to England. Our move to the south has kept us in strong; favorable winds sever since the first day's light air. We have not had to bash against easterly winds, like boats to the north. Our team of on-board and on-shore routers say that this is still the way to go, as far as we can see. Adrian Gruzman, Australia. Adrian is a barrister from Sydney, Australia, and veteran of innumerable Sydney-Hobart and other big ocean races. Adrian has skippered in the worst sailing weather in the world, and is totally unfazed by the minor problems of an Atlantic storm. He can get his sleep anywhere, any time. Max Hutter flew from Vienna to join the crew as a watch captain. With American and Austrian citizenship, he has wide racing experience and recently turned professional. His email handle is "yachtsman supreme", which is a good description of his super-steady helming skill and his quick eye in managing Tempest's highly complex deck work. Tomas Mark from Stockholm is our only other repeat crewman (with me) from Tempest's 2003 race to Germany. A sail maker by profession, Tomas not only works on sail repairs with Ashley, but also replaces all the chafed ends of sheets, guys, and halyards. His many skills are invaluable on a race like this. Dutch citizens Rudolph (Ruud) Blanc and Monique (Miek) Splinter are the owner's professional all-year-round crew. We do not get to choose them, but we could not have been more fortunate in having them aboard. (This is not blathering for their benefit, they won't read this.) There is nothing they can't do cheerfully, promptly and perfectly. Yesterday Ruud disassembled one of boat's computer monitors, dissected the pieces, dried them, and put them all together again in working order. Awesome. Peter Becker, our senior watch captain, is the indefatigable 100 miles per hour irresistible force. He bounds across the deck with his Ming the Merciless black rain cap, and cannot rest until everything is perfect. And even then he does not rest. Steve Lirakis, watch captain, is also a dynamo of energy, keeping his eye on everything and telling good stories all the way. We learned that like Will Hubbard today, Steve did his first transatlantic race when he was a 21-year old college senior. Will Hubbard, bowman, is the youngest aboard, but ready to race Ashley to go up the mast on a moment's notice. His enthusiasm is contagious. The two Bills -- Hubbard and Morris -- have fitted right into the steering rotation and keep the boat moving. Bill Hubbard stuck to ginger cookies for two days until he felt 100 percent again, but is now back in the trough with the rest of us. Reinforced the idea that heeling over excessively is not fast. Carrying extra main cars is essential and the ones with â€˜crayonsâ€™ instead of ball bearings are the best. Using loctite when assembling batten cars is essential if there is not locking setscrew. Using bike chain works great to mouse halyards especially at the dock however, it should be electrical shrink wrapped so as to keep it straight and not allow it to kink and possibly wrap around spreader bars in the rig. Around twilight we decided to take down our heavy asymmetric spinnaker. We were reaching our first goal -- the Gulf Stream -- but the wind was dying and the spinnaker was collapsing. The crew flooded the deck to get the new lightweight drifter hoisted, and to take down the big spinnaker. The spinnaker halyard was eased slightly to start lowering the sail. Four of us were ready underneath to catch the sail and pull it down to the deck.Suddenly we were caught in an avalanche of nylon. The whole sail fell on us and partly over the side into the water. Instead of an orderly takedown, the sail had come loose and fallen 100 feet in a couple of seconds, wrapping the crew in about 4000 square feet of fabric and making us pull its corners quickly from the sea. We looked at the shackle that holds the halyard to the top of the sail. The line had chafed through. The shackle was in our hands, but the spinnaker halyard was now dropped inside the mast. Darkness was coming, and something had to be done. Otherwise that spinnaker halyard would be useless. The first person ready to go up the mast is always Ashley Perrin. From California, Ashley rockets around the world sailing races everywhere. There is little she can't do in a boat; just this morning, she used the heavy-duty sewing machine we brought with us to repair a rip in a sail. Tempest, like almost all big racing sailboats, has four halyards to raise the sails at the front of the boat. Two for the genoas and about three feet higher -- right near the very top of the mast -- are the two spinnaker halyards. All four run inside the mast, then emerge at the top. They are not interchangeable. You can't use a genoa halyard for a spinnaker, or vice versa. It is critically important to have all the halyards working, and now one is useless. Ashley is hauled up to the top of the mast. It is not a fun experience. Every motion of the boat is magnified greatly at the end of a 100-foot pole. Even though Tempest is moving slowly in light air right now, the mast is swinging steadily. This is an ideal time to get the repair done, though, because in any other wind condition, the motion is likely to be worse. Job: Slide a bicycle chain into the mast to lead a new line down to the bottom. However, the bicycle chain gets stuck. Despite jiggling and pulling, it won't go up and it won't go down. Nothing more can be done now; darkness is settling in. Bring Ashley down. Ashley cannot come down! While trying to fish the new line down the mast, the bicycle chain has somehow entangled itself around the second halyard, the one holding Ashley 100 feet in the air. This is serious. Ashley must be lowered to the deck. The crew sends the one remaining jib halyard up to Ashley. She must now take the end of the jib halyard (which exits below her), attach it securely to her harness, and untie herself from the now-jammed spinnaker halyard. It is difficult because all her weight is carried by the higher halyard, which she must untie. She manages to free herself from the stuck line, and is lowered to the deck as darkness settles in. However, the problem is now worse as the broken halyard is still not re led and the second spinnaker halyard is now at the top of the rig tangled with the bicycle chain. So Tempest is racing with no way to hoist a spinnaker. These sails add one knot or more of speed when the wind is to the side or behind the boat. Nobody can afford to give away one mile per hour and hope to win a prize. Somehow tomorrow we must fix it. While all this was gong on, Tempest slid into the Gulf Stream and started its downstream ride at about four knots. Extra mouselines were put into the mast before leaving the dock in the jib sheaves but we didnâ€™t do the spinnakers as we ran out of line at the time and didnâ€™t get back to that job. These extra mouselines are important as it guarantees a fair lead and no tangles in the mast as you have time to get it right on the dock. Always put chafe guard i.e. Samson Ice on all halyards where they bear on the sheaves. The light shifty winds over the last 24 hours mean we have only sailed 100 miles sometimes sitting at a dead stop. We are in the company of larger boats in the same position. Light conditions mean many sail changes. And sail changes on this boat, with its 100-foot mast, mean lugging sails, some weighing 200 pounds, hoisting them -- with the aid of electric winches, fortunately -- and then carefully folding and lashing down the sail replaced. Difficult and time-consuming challenge when the wind is up and the boat heeling.Â Right now the wind is blowing 15-20 knots and we are heeled 17 degrees, making excellent speed --over ten knots -- toward the Stream. The bigger boats that were drifting near us earlier in the day now have the wind to take off and are ahead. We are heading for a strong southerly wind that will fill in around Wednesday. This will allow us to set the spinnaker, turn north east to England and fly away at speeds that will at times exceed fifteen knots. The crew of Tempest is amazingly diverse six Americans, two Dutch, one Dane, one Swedish, one Australian, one British, two Canadians and two hybrids, one US/UK and one US/Austria. There are two women and fourteen men. When the project began, nobody knew more than three of the others. We found each other by endless phone calls, emails, and word-of-mouth recommendations. Three watches of 5 each on deck for four hours, off for four and on standby for four meaning there are 10 crew available at a time for sail changes. The navigator 'floats*, or is on duty as much as required. Lesson learnt: Donâ€™t be over early on a long race and taking educated risks could pay off!